"Today we are standing in this cathedral not as owners but neither as guests. We are the bearers and heirs of the Baptism of Volodymyr, and as a Church we are direct successors of the ancient Kyivan Metropoly. Yes, the Ukrainian Church suffers in her body from the wounds of disunity caused by the interference of external forces and by our own faults. 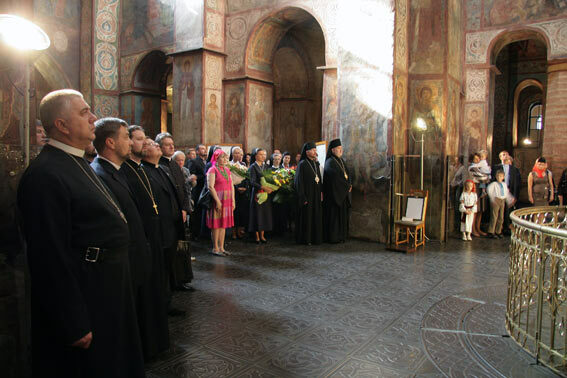 Though disunited, we are not estranged from one another” – said His Excellency Bohdan (Dzyurakh), Secretary of the Synod of Bishops of the UGCC, in St. Sofia’s Cathedral during the celebrations of its millennium. Talking about the problem of disunity of Christians in Ukraine, Bishop Bohdan said: “Today we are asking forgiveness of God and of our brethren for our wrongdoings and sins, and, on our behalf, we forgive all those who did wrong to us, voluntarily or involuntarily. We are imploring God’s blessing for our people, the gift of Divine Wisdom for our spiritual and state leaders but, foremost, we are praying for the gift of unity for all the heirs of the Baptism of Volodymyr for whom this sanctuary is very dear”. "Today we are standing in this cathedral not as owners but neither as guests. We are the bearers and heirs of the Baptism of Volodymyr, and as a Church we are direct successors of the ancient Kyivan Metropoly. Yes, the Ukrainian Church suffers in her body from the wounds of disunity caused by the interference of external forces and by our own faults. Though disunited, we are not estranged from one another” – said His Excellency Bohdan (Dzyurakh), Secretary of the Synod of Bishops of the UGCC, in St. Sofia’s Cathedral during the celebrations of its millennium. Talking about the problem of disunity of Christians in Ukraine, Bishop Bohdan said: “Today we are asking forgiveness of God and of our brethren for our wrongdoings and sins, and, on our behalf, we forgive all those who did wrong to us, voluntarily or involuntarily. We are imploring God’s blessing for our people, the gift of Divine Wisdom for our spiritual and state leaders but, foremost, we are praying for the gift of unity for all the heirs of the Baptism of Volodymyr for whom this sanctuary is very dear”. Afterwards, His Excellency Josyf (Milian), Auxiliary Bishop of Kyiv Archeparchy, on behalf of His Beatitude Sviatoslav, presented with letters of gratitude those people who made a special contribution to the celebrations of the millennium of St. Sofia’s Cathedral in Kyiv. The letters of gratitude received: Viacheslav Korniyenko, Nadia Nikitenko, Myroslav Otkovych and Nelia Kukovalska. The joined choir of the Patriarchal Cathedral and St. Nicholas the Miracle worker Parish performed spiritual songs during the celebrations. After the official program in St. Sofia’s Cathedral, the celebrations continued in the Metropolitan rooms where the guests could take a look at the exhibition of a national artist of Ukraine Myroslav Otkovych.